The Orange-Chatham Sierra Club is proud to announce the endorsement of these candidates for the November 3, 2015 election for town council in Chapel Hill. This year’s election for Chapel Hill Town Council has focused on choices about growth and development. The Sierra Club recognized the environmental impacts of sprawl, and the benefits of smart growth, as far back as the mid-1990s. Bell, Parker, Storrow and Ward have voting records and stated priorities for smart growth, with moderate-density mixed use development that will support walkability and bike-ability, as well as transit improvements, both economically and in ridership. This path is important to Chapel Hill’s commitment to the rural buffer, to climate action, to cutting impervious surface, and to storm water management. It is also critical for maintaining a town budget that will support transit, green spaces, our beloved leafy, historic neighborhoods and the amenities that Chapel Hill residents desire. In addition, these candidates’ decisions, and the Chapel Hill 2020 plan that is currently being implemented, are based both on experts’ opinions and unprecedented public outreach. Although not every new building will be to everyone’s liking (and, given fiscal and legal constraints in the process, some will not meet the highest environmental standards) through their decisions, the endorsed candidates have demonstrated their understanding of, and support for, the concept of “sustainable growth.” They have specifically noted their support for the Durham-Orange light rail project that is “overwhelmingly popular” with 69% of polled voters in Chapel Hill, and they have taken positions promoting the compact development that has been shown elsewhere to reduce pollution, protect natural resources and improve quality of life. Smart growth is better for the planet. As the Intergovernmental Panel on Climate Change noted in their last mitigation report: “Infrastructure and urban form are strongly interlinked, and [will] lock-in patterns of land use, transport choice, housing, and behaviour. Effective mitigation strategies involve packages of mutually reinforcing policies, including co-locating high residential with high employment densities, achieving high diversity and integration of land uses, increasing accessibility and investing in public transport and other demand management measures.” Smart growth measures are also more economically viable for communities. SmartGrowth America’s report, “Building Better Budgets: a National Examination of the Fiscal Benefits of Smart Growth Development,” notes that smart growth generally costs one-third less for upfront infrastructure, saves an average of 10 percent on ongoing delivery of services, and generates ten times more tax revenue per acre than the conventional suburban-form development. This form of vibrant, walkable community is also more attractive to the young creative class and better supports small businesses on those walkable streets. The incumbents, and Michael Parker in his work on the Planning Commission and other planning efforts, have shown by action and support that they understand the practical realities and benefits of smart growth for Chapel Hill, and want to continue this work. The endorsed candidates have demonstrated knowledge and leadership consistent with policies that encourage environmental protection of local natural resources, conservation, and sustainable growth. The Sierra Club believes that Chapel Hill’s environmental goals, and budget, will be best served with the endorsed candidates. I'm happy, but not suprised, to see the Sierra Club make very solid endorsements. How is CHALT going to spin this? Make accusations that the Orange-Chatham Sierra Club is in the pocket of developers? Or that the Sierra Club doesn't know what its doing? Or their math is wrong? Or the Sierra Club doesn't listen to environmentalists? The possibilities are endless. I also can't help noticing that to date none of the groups issuing endorsements have come out in support of CHALT candidates. The only major endorsement left is The Independent, and its almost certain to echo the conclusions of the others. North Carolina's main advocates for labor, LGBT rights, and the environment have all endorsed the incumbents and Michael Parker. I do wonder what CHALT makes of this lack of support from the key progressive advocacy organizations. I'm not part of CHALT but I don't find these endorsements surprising at all--these are groups that always endorse the incumbents. In part that's because the incumbents have a record, eliminating anyone who has not been active in any kind of advisory board involved in land use planning from consideration. In the case of the AFL-CIO, those endorsements are pure politics. How they could, with a straight face, endorse the incumbents after the way Clyde Clark and Kerry Bigelow have been treated is beyond understanding and flies directly in the face of advocating for labor rights. What I found most interesting was the non-endorsement for the mayor's position. Clearly Pam Hemminger has the best environmental record so instead of endorsing a non-incumbent, the Sierra Club decides to stay silent. If that doesn't provide evidence of the favoritism shown for incumbents, I don't know what would. Thank you for your thoughtful analysis. But I think there are a few problems with your argument. First, only three candidates are incumbents. These organizations could have endorsed the 3 incumbents and then given the 4th slot to a CHALT candidate. They very deliberately opted not to put a CHALT candidate in that slot. Two of the CHALT candidates have pretty extensive records. Nancy Oates has been writing articles about these issues for years. David chwartz also has a very extensive written and documented record. Given that Nancy Oates is currently leading the pack according to the PPP poll it seems even less plausible that these endorsements were purely strategic. I personally think that the endorsed candidates are much more in line with the values of these organizations and that this is a much more plausible explanation of the endorsements. I knew when I posted my comments that you wouldn't agree so I'm not surprised. You have created a public narrative that CHALT has the evil intent of stopping any progress and that the incumbents + Parker (I see them as a single unit personally) are the light of the progressive world. We simply disagree. And I'm sorry to see Mark Kleinschmidt, someone who I have always respected, making such a ludicrous and knowingly inaccurate claim. I really hope you have misquoted him. We do disagree but I will say, genuinly, that I have enjoyed our back and forth. I think that outside of select few (albeit, important) municipal issues we are political allies and have many of the same values, even if we disagree on the best ways to enact those values locally. Whoops, I missed an excuse. The press release is very detailed: they come right out and say the many reasons for the endorsements. The listed candidates have positions on growth that fit in with the club's own vision are based "both on experts’ opinions and unprecedented public outreach." But I don't need to quote more, since anyone can read the release and see how far off from mainstream best environmental practices CHALT has positioned itself. I'm not saying that the average citizen can't serve on the council, but CHALT simply doesn't have any background or understanding of the environmental effects of their platform. Note that Michael Parker isn't an encumbent, so the idea that they only support encumbents isn't true. From reading the endorsement, it seemed like these were the major drivers. While I do suspect likelyhood of winning is a consideration, it seems like, support for light rail and allowing density to preserve areas in and beyond the rural buffer were major considerations. Cheeseburger! As our old friend Gerry Cohen would say, "So much anger!" Let me see whether I can put this into perspective for you. The Sierra Club lost a lot of credibility when it teamed up with the Chamber of Commerce to sponsor one of the first forums. The Chamber and its business members are not real big on protecting the environment, as you may know, except for how it can be made into a profit-generator. Neither is Michael Parker, who showed his true colors with Ephesus-Fordham and Obey Creek. That all kinda compromises what the current SC stands for. I'm thinking the SC didn't dig real deep for these endorsements. And they sure don't seem to be paying attention to what goes on at Town Hall. The local chapter of the AFL-CIO endorsed the incumbents even though they brought in a union-busting organization from Raleigh to handle the Sanitation 2 kerfuffle. Bet that wasn't brought up on the questionnaires or interviews. And the Equity NC folks endorsed one candidate because he lives in Chapel Hill and has a pet. So much for looking at the real issues. Historically, the endorsements usually go to the incumbents, who are part of the establishment, just as Orange Politics and the Chamber are part of the local establishment. CHALT is part of an anti-establishment movement, so it's no surprise that those groups and their minions would talk up the importance of their endorsements. And I wouldn't expect too much deviation on any of those fronts, would you? Bottom line: These endorsement don't make a lot of sense to anyone who's been paying attention. thanks for the shoutout DEvans. Correcting that it's Cheeburger-Cheeburger however. Personally there is another barely-mentioned new candidate I've been very impresed with, Jessica Anderson. I've talked to her several times, and while we might only agree 30% of the time on development issues, I think she would bring a welcome new perspective. I don't think we should treat everyone who has any connection to CHALT as a pariah. A board that is broadly representative does better for the community. On the outside of Chapel Hill political side of things I get the impression that she's to the left of most of the council FWIW. When looking at enviromental impacts I breathed a sigh of relief when Obey Creek was approved. In looking atObey Creek...about 2/3rds of the land close to 80 acres is preseved forest. Additionally, there was incredible effort put into having really terrific stormwater manangment. On top of this you have to remember that existing zoning for Obey Creek was single family residential which means that if a developer wanted to come in and turn all 120 some odd acres into a massive housing project there was probably not so much that could have been done to stop that, which, while I am not an enviromental expert, I suspect would be worse as you would have a lot more disturbed land. So I cannot really say that I think Obey Creek is a reason to criticize the Sierra Club endorsement. If building a shopping center on the outskirts of town where residents will have to drive anywhere they want to go (unless they are young enough to make it up a very steep slope to get to an overcrowded bus) is what you consider environmentally sensitive development, I can understand why you and I disagree. If building a shopping center on an already overburdened roadway is what you consider community-sensitive development, there's further evidence of our disagreement. If approving such a large development in a rush rush fashion, against the requests of your Planning and Transportation Boards, is considered thoughtful leadership, then we probably won't find anything about this that we can agree on. Don't get me wrong, there are some positive aspects to the Obey Creek plan. Citizens, including those you diss as "CHALT," advocated for some of those features in the 15-501 South focus group. But they are all overshadowed by the scale of the approved development. The developer wisely added a few crumbs to add the gloss of sustainability to the project. But a pig is a pig no matter how hard you try to label is as smart growth. One last rant: Going out and asking people what they want and putting those notes into an appendix never to be seen again until you need to quantify "unprecedented public outreach" is disengenuous. Terri, thank you for responding. First I just want to say I am just stating my opinion as to why I don't think Obey Creek should foreclose a Sierra Club endorsement. My intention is not to mock or diss anyone. In examing this I would look holistically at the situation rather then taking the Obey Creek plan in isolation. First when you look at the previous zoning for Obey Creek the current development is not bad. It preserves a lot of open space, and foreclosures low density residential on the property that could otherwise go up with little town interference due to the prior zoning scheme. Next I would remind you that our neighbors to the south recently approved Chatham Park which means that particular area is going to be rather central from a regional perspective in the not too distant future and having a mixed use development there could be a valuable economic generator. As to traffic, that is a very legitimate concern, but again if we want to look at this in context that land would otherwise not be vacent forever, and this way we can insure 2/3s stays undeveloped. Furthermore I would note that Obey Creek is not going to be the main driver of traffic in that area nor will it be a significant driver of traffic, when again you consider the 7,000 acre development that is occuring a short drive south of there and honestly I think improved transit options are going to be the only effective long term solution to traffic in the area. For this reason while there are legitimate concerns about Obey Creek, and perhaps the process could have been better, I can't say I think the result was bad environmentally or otherwise. Council had 3 options available to them on Obey Creek. First, they could have left the zoning as it was. If any developer actually believed it was worth pursuing, they could have built a handful of large houses, but given the steep slopes, those houses would have been very expensive to build. So it's questionable that development would have occurred over the entire tract even without rezoning. Plus, it was part of the density swap that created Southern Village so leaving it alone would have honored previous agreements. But keep in mind that a large number of residents agreed that the swap should be undone and denser development should occur. So any claims of NIMBYism or no-growth labels are totally misplaced. It is the scale of the approved development that has caused the breach. Third, the Council could have explored the smaller footprints that were being advocated for by the Compass Committee and the Planning Board. But instead they listened to the developer who (as has been his performance history) declared nothing smaller would be acceptable. I understand your thinking,but it is incomplete at best. Choices were available. Assumptions were made, like you are doing, about Chatham Park and its impact (what will we have that they won't already have on site or get from Cary where they will be working?). The incumbent Council chose to ignore or dismiss citizen concerns on traffic even once they understood the scope of the problem. External expert opinion was privileged over local expert opinion. And real, fact-based financial studies were deemed unnecessary in exchange for sound bites on property taxes. If you ask me to build you a car, I'm going to build you something that looks like what we all know. If you ask me to build you a way to move here and there with minimal environmental impact, I would probably build something more like a bicycle or possibly something altogether new. The town told the developer they wanted a shopping center (retail study) and they got one. That isn't smart growth. And the process that brought us this un-smart growth development was seriously flawed. First off given that tract of land's size I think it would be more then a few houses. My time on the board of adjustment has taught me that vacant land is becoming increasingly scarce in Chapel Hill and because of our desirability as a community people will go to great lengths to have a stake in Chapel Hill, even if it that means working with extrodinarily difficult lots and I often find myself applauding folks dedication to do so, to make a home for themselves in our community. So based on what I have seen I seriously doubt terrain would have been a real barrier to significant development on that tract within the zoned purpose. Second, Obey Creek was in the pipeline for 6 years and while board imput is important I think at least with regards to the planning commission part of the issue was the structure of the resolution the town presented them and its inflexibility as much as more more then a general opposition to Obey Creek. On top of this when negotiating with developers I think one thing we have to understand is it is a true negotiation. Chapel Hill and North Carolina do not have a Communist system where the government can dictate development models unilaterally, instead the town has negotiating power based on legislative grants of authority. As such, just rejecting and demanding things from a developer that the developer is not prepared to do is not a strategy to encourage growth. This is part of why I tend to be skeptical of a philosophy that promises growth through antagonism towards developers. If approval of Obey Creek was rushed, then how many years do you think approval of a construction project should take? The best you've got is conspiracy theories? 1. The Sierra Club once co-sponsored a forum with the Chamber of Commerce. 2. The Chamber of Commerce is bad because it represents local businesses. 3. Therefore the Sierra Club is bad. This is just one of the reasons CHALT can't be taken seriously: it is in way over its head. The Sierra Club was very specific and articulate about why it supports the actions of the current council. The actions CHALT is proposing would have the opposite result of what its advertising because it doesn't know what its doing, a fact which is recognized by every professional organization in the area. The Chapel Hill Town Council endorsements come from the Orange-Chatham chapter of the Sierra Club, not the North Carolina chapter of the Sierra Club. Making it look like a state-wide endorsement does local voters a disservice. Orange Politics should clarify that. Hi Don, that's not correct. The NC Chapter of the Sierra Club makes all endorsements, based on the recommendations of the local groups. To recommend a candidate to the state committee requires a two-thirds vote of both the local group's executive committee as well as the local political committee. The statewide political committee must then review, approve, and they are the entity actually making an endorsement. Nice! So an infinitesimal portion of the local Sierra Club passes along a recommendation to an infinitesimal portion of the state chapter, and the state chapter endorses candidates it knows practically nothing about. Looks like the Sierra Club endorses without any input from the vast majority of its members, and voters are led to believe this is a righteous organzation when in the political realm it's run by a clique. As long as the Sierra Club remains ignorant of local issues, it should stop making spurious and uninformed recommendations. Its endorsements do a disservice to the community and cast a pall on its own good works. I believe in future I will make a point of not voting for any candidate endorsed by this group. The Sierra Club gave very sound reasons for endorsing the candidates they did.Their reasoning was directly related to local disagreements (density development, transit etc). Their reasoning was also very sound. CHALT's model did not fit with their model. Your strawmen are becoming more and more absurd. 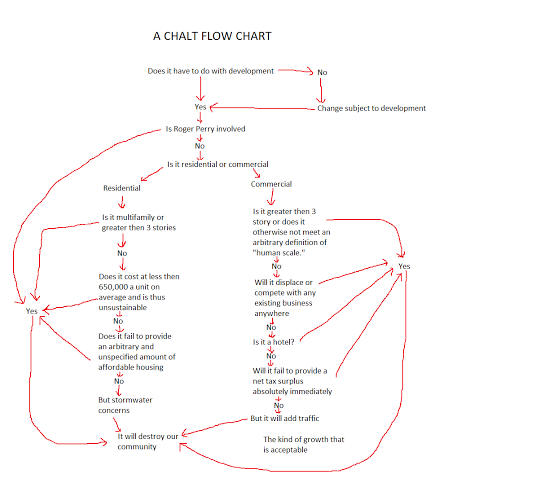 By the way, if anybody would like to see a flowchart of CHALT concern trolling, a friend of mine made a wonderful guide. A person who posts on a blog thread, in the guise of "concern," to disrupt dialogue or undermine morale by pointing out that posters and/or the site may be getting themselves in trouble, usually with an authority or power. They point out problems that don't really exist. The intent is to derail, stifle, control, the dialogue. It is viewed as insincere and condescending. A concern troll on a progressive blog might write, "I don't think it's wise to say things like that because you might get in trouble with the government." Or, "This controversy is making your side look disorganized." Don may disrupt dialogue but he does it through direct, blunt criticism. He never dissembles. He doesn't resemble a concern troll as defined by the urban dictionary in any way whatsoever. That's a fair point. I stand by my other comments (and absolutely stand CHALT concern trolling) but it's not fair to describe Don as being a concern troll here. I apologize.